The luck of the Irish will be on your side in this all new gambling slot game. Perfect for small gamblers with bet sizes as small as 0.01 ranging up to a respectable 5.00. This is a 5x3 reel game and features all the typical things you can expect from an Irish theme, from the Leprechauns to pots of gold and horse shoes. 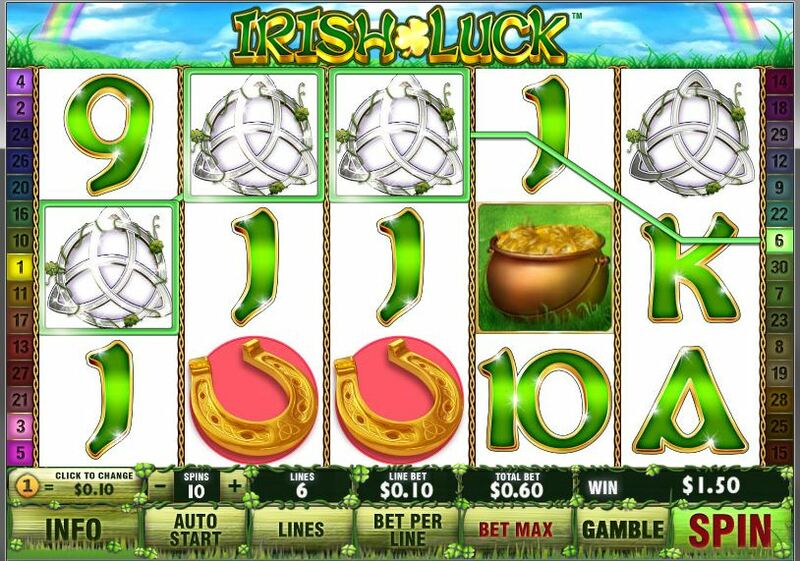 Of course, being called the Irish Luck Jackpot means this slot has a generous progressive jackpot feature along with other bonus features to keep you entertained and always on the hunt for those big pay-outs. We hope you do manage to get some, so deposit now and get spinning those Irish reels. This game has been brought to you by Playtech, one of the market leaders for online casino software’s, founded in 1999 in Estonia and now operating in 17 countries with over 5,000 employees. Mostly famous for their casino and poker games but they have an interest in all areas of gambling including slots. The company has helped to shape the gambling industry with almost 20 years’ experience you can see why they’ve been so successful when you play their games. You can find out more about their games here. Progressive Jackpot: This feature is a Jackpot that increases for every spin that the Jackpot is not won, this can end up reaching massive amounts that a lucky play will end up winning, let’s hope it’s you. Wilds: Represented by the four-leaf clover, this can be substituted for any symbol to form a winning payline. Scatters: Three or more fairies on the reels and this will trigger the match and win bonus. Also, three or more Leprechauns will trigger the pick me bonus. Irish Gamble: after hitting a win you can decide to gamble to double its value. Put your fait in the hands of a deck of cards, will the card be red or black? Although be careful, If you lose you’ll lose your winnings. Well, if you haven’t played Irish Luck before you should, we highly recommend it. This fun Irish themed slot definitely lives up to the hype, its simple to play but still has a range of fun and inventive bonus features available for its players. The game offers excellent graphics that will keep those interested in visually pleasing slots entertained for hours. We’re sure you’ll fall in love with this slot and if you do be sure to check out some other games, you could try Orient Express.